It's not so difficult to get independent treasures into our libraries says Tricia Genat. Thanks to ballina70 for use of this image Readiscover under Creative Commons. Where both libraries and bookshops will stock bestsellers, libraries are looking for a little bit more. ‘People are interested in all sorts of weird and wonderful things,’ says Genat. Librarians want to make sure that they’re, ‘expanding the collection to include more unusual [publications] or some new trends or different kinds of formats,’ she says. Verily libraries provide a solid opportunity for independent publishers to get their work to readers. In contrast to being included in bookstores (which can be complex and difficult for independent publishers), Genat says that there are no disadvantages to getting books into libraries. ‘One of the major advantages for small publishers is that they’re in an open field competitively,’ Genat explains. Librarians have wider mandates and make their decisions about buying a book on a computer screen using filters based on genre, category etc. ‘When the library selector is scrolling through those titles your book has as much chance of getting picked as one from [a major publisher],’ Genat says. There are however, a few provisos. To be noticed on the computer screen you’ll need a decent cover and a well-written blurb. ‘If you’re a small publisher and you spend absolutely no money on your cover (and it’s going up against lovely covers) then a library selector is just going to scroll past yours and not select it,’ Genat warns. ‘If the blurb that you’ve written is correct, up-to-date, informative and helpful then that’s the second thing that the library selector looks at,’ she says. If you make these elements the best you possibly can your book will be in contention for selection. Library selectors read blogs, newspapers and sites like Goodreads. ‘If [a library selector] sees a name that pops up as they scroll through the list (ie a brand new author, a brand new publisher, a tiny publisher that’s causing a little buzz) they will [remember it],’ says Genat. The selector’s decision is only a $20 or $30 one – at times they can just order a book and see what happens. ‘If it gets borrowed half a dozen times then that’s a publisher or author [the selector] might add to the standing order,’ says Genat. She says that social media is absolutely essential for publishers in this context. ‘If it’s out there people will be reading it,’ she says. (For more on publishers and social media read this post on vertical marketing). In addition to considering cover designs and blurbs, independent publishers also need to pay attention to things like ensuring page numbers are correct, that there’s a bar code on the back and that the book has an ISBN. ‘The physical quality is also important. It can’t fall apart,’ says Genat. Recently she had to return an order of over 30 books because of their poor quality. ‘There was absolutely nothing wrong with the content of the book. The printer just did a bad job,’ she says. In the meantime my Internet searches aren’t confirming whether Woolf said sunk or sunken (or where she said it). I can see that the British Library are going for sunk, and I figure that’s a reliable source… but I might just need an excuse to ransack my local library this afternoon. You never know what independent treasure I’ll find. Genat’s panel Libraries and Librarians will be held at 1.15pm, Friday 14 November at the Independent Publishing Conference. For Christmas last year Wayne Macauley’s partner gave him a t-shirt printed with the words Most Underrated 2012. ‘I don’t wear it out that often but it’s a beautiful thing,’ Macauley quips. The t-shirt is a reference to last year’s inaugural Most Underrated Book Award (MUBA) which Macauley won for his novel The Cook. ‘[The most underrated book] is a very catchy line and I think people like the idea of it,’ Macauley says. ‘[The award] got quoted a number of times afterwards in blogs and reviews and even when the book went overseas.’ As Macauley notes, the title of this award, ‘has a hook’. The MUBA, says the Small Press Network (which organises the award), ‘aims shine a light on some of the outstanding titles that are released by small and independent publishers that, for whatever reason, did not receive their fair dues.’ This year’s shortlist was recently released. It includes Fish-Hair Woman by Merlinda Bobis (Spinifex Press), Staunch by Ginger Briggs (Affirm Press), Whiskey Charlie Foxtrot by Annabel Smith (Fremantle Press) and The Hum of Concrete by Anna Solding (MidnightSun Publishing). The winner will be announced next week. Readings will help the MUBA shortlisted book make their way into the hands of readers. Thanks to Snipergirl for use of this image, Readings, Carlton under Creative Commons. ‘[Last year] there was some uncertainty as to whether this was a badge that authors particularly wanted or not,’ says Martin Shaw, Books Division Manager at Readings. ‘But most people got what it was about – it was trying to make sure that nobody got completely overlooked – which does happen,’ Shaw says. The 2013 Most Underrated Book Award winner will be announced at the Independent Publishing Conference on Friday 15 November. Anyone in publishing knows the wonderful things that can happen in small spaces. Award winning manuscripts have been produced in back yard huts, burgeoning publishing empires started on kitchen tables and literary classics typed out clack-by-clack at lonely desks. So too this year’s Independent Publishing Conference (14 to 16 November) - for the past few months Tim Coronel, Conference Coordinator, has had his laptop perched on the edge of the only desk in Small Press Network’s office (a space he once described as a fishbowl). ‘It’s a small office which is three by three metres (if that). Like all publishing spaces it’s full of books and bits of paper and a carton of wine – which is very useful at times,’ Coronel quips. This year’s conference came together with the work of an impressive planning committee (Michael Webster, Emmett Stinson, Aaron Manion, Andrea Hanke, Catherine Lewis, Mary Masters and Nathan Hollier – with Coronel bringing it all together). It’s the second of its kind but 2013 promises new ideas. ‘We’ve made a conscious effort not to double up – not to get the same faces back again,’ says Coronel. ‘There’s probably twice as many sessions and speakers as there were last year - both days of the conference are going to be running parallel sessions.’ (ie two sessions in each time slot). Big things can happen in little spaces. Thanks to PetitPlat - Stephanie Kilgast for use of this image Tiny Study Room #3 under Creative Commons. Coronel hopes the conference will soon become an ‘annual destination’ for the Australian publishing sector. ‘It’s the only opportunity in Australia for publishing professionals to get together like this. You can be tweeting with people and emailing people back and forth for years and never have the chance to actually meet them face-to-face,’ he says. Both the industry and academic day programs have been shaped to meet the needs of these independent publishing individuals. There’s over 16 sessions on the topics of markets, marketing, trends, different genres, rights, distribution, reviews, libraries and all manner of publishing. Funding: from crowds to grants will feature a panel including Anna Maguire, author of Crowdfund it!, Sophie Cunningham, Chair of the Literature Board with the Australia Council and Zoe Rodriguez, Cultural Fund Manager at Copyright Agency Limited (chaired by Sam Twyford-Moore, Director of the Emerging Writer's Festival). Coronel notes that the act of publishing has become far less exclusive than it once was. ‘I think it’s getting easier and easier to publish in the most basic sense – to get your words out is simple,’ he says. To wit one of the biggest challenges for publishers these days is in finding an audience. ‘To find a paying audience is even more of a challenge and to generate enough revenue to make a sustainable business is hard. It always has been,’ he says. Still that’s not to say that humble beginnings can’t result in big things – after all this year’s Independent Publishing Conference has been brought together by the efforts of Coronel – a solitary figure with a laptop perched on the edge of a desk. In amongst the crowd, everyone else seems to know one another. This time last year, I doubt I’d have known anyone. But this year I find someone I know (and there’ll be two more as the evening continues). While my friend and I chat, the official launch of the 2013 Emerging Writers' Festival (EWF) program looms and EWF staffers usher us to our seats. When one gets to me she smiles. ‘Oh! Hi Pepi! I didn’t know you were going to be here,’ she says warmly, ‘but then again…you’re always at EWF things!’ And I smile too, because it’s true. I am. I only learned about the EWF a year ago. But I’ve been an absolute fan since. This is because the EWF has been at the foundation of my achievements in the past year. I might not be the greatest at making and designing fan-cards but I am one of EWF's biggest fans. I might be new to EWF but this year it’s celebrating its tenth anniversary. I can’t begin to imagine how many careers it has ignited in that time. For me it started with an encouraging PS on a kind of ‘rejection’ email to last year’s call for writers. I’d expressed my interest in the context of experiments I had done using Kindle as a way to publish long form non-fiction. ‘PS’, Karen Andrews (EWF's Program Manager) wrote at the bottom of the email, ‘On a personal note, I really like your idea of long-form work potentially finding an Amazon/online audience. Good luck with it.’ I liked that she liked my idea, and her encouragement fed another idea I’d been kicking around for a while. A week later, the first fizz of EWF-inspiration took action, and I started planning this blog. The 2012 Festival arrived and I was heartened by what I learned. I paid just $65 for a weekend of Town Hall conferencing which was unbelievably good value. This was one of the best investments I’ve made in my writing career so far. At the conference I made a new writer-friend. I learned that I was not alone in my goals and aspirations. I was inspired by the experiments of other writers dealing with our changing publishing environment. I became convinced of the need of a platform in which to write regularly. A month later I launched this blog. My original intention was to write and post a few weeks in advance, but I was far too inspired. So I uploaded four of the five posts I had already written, backdating them to May. (Read my first post: Give up the newsroom or your career gets it). That may have been enough inspiration from one festival, but for me at least, the EWF is a festival that keeps on giving. Andrews’ PS and the Town Hall Conference were just steps one and two. There were plenty more to come. I kept writing my blog every week. I started with no readership, but loved the discipline of writing and thinking about writing regularly (and still do). When the EWF put the call out for Emerging Bloggers for the Melbourne Writers Festival I put my hand up. I’ll never forget the thrill of learning that Future of Long Form had been selected. I was whooping through our empty house. The EWF had given me a great opportunity. In August 2012 when the Emerging Blogging gig began I was struck by the warmth of both EWF and MWF staff. I didn’t know it yet, but EWF was making me a part of a writing community. I now had new writer friends and industry contacts (including my fellow Emerging Bloggers). Thanks to my MWF/EWF calling-card doors opened to interviews with prominent writers and organisations like Creative Nonfiction magazine, Robin Hemley and Margaret Simons. Plus I had ten days of uninterrupted inspiration with my cherished free festival pass. At the end of the festival I wholeheartedly thanked both the EWF and MWF for an amazing experience - somehow thinking their contribution to my career couldn’t get any better than this. Ha! From Andrews’ PS, to the Town Hall Conference, to starting my blog, to becoming a blogger for MWF came a new opportunity. Based on my interview and post about Robin Hemley I was selected as an official blogger for the NonfictioNow conference. It’s another opportunity to interview great writers of international stature and I was gifted with more days of inspiration at that conference. By then I'd developed the discipline of writing everyday, and I felt that my work was all the better for it (of course, I’ve still got a long way to go). I also learned a huge amount about long form, writing craft and distribution. I had some impressive names on my blog, which lead to more great names, which increased my readership. All of this makes me consider that none of this would have happened without the EWF. But it doesn’t even end there! It’s no wonder I’m a card-carrying fan. In January 2013 I got two more whoop-worthy emails, which I wouldn’t have, were it not for the journey that EWF began. Imogen Kandel, Online Editor of Killings (Kill Your Darlings blog) invited me to be a 2013 columnist on Books and Writing. (My work was first exposed to Kandel during MWF). And the Wheeler Centre awarded me a Hot Desk Fellowship. I doubt I would have applied for the fellowship if the EWF team (especially Karen Andrews) hadn’t encouraged me and my new writing career all those months ago. (Props too, to former Director Lisa Dempster and new Director Sam Twyford-Moore - love their work!). So yes, that’s why I am a card-carrying fan of EWF - and that’s why you’ll often see me at their events. I hope you'll all go to plenty of events (view the program here) because you never know what might happen. And when you do go, come and say hello. I’ll be at the Town Hall Conference and other events and will be tweetings. Riding the bus home with my newly purchased e-reader tucked into my bag I felt a little pang of guilt. Had I cast a stone at the institutions, which brought me nothing but joy for decades by obtaining this little gadget? Was I just one node in a death of a thousand page-clicks to the bookstores that I love? With paper-books I can browse shelves in any bookstore I want. The e-reader on the other hand forces me to a limited ‘ecosystem’. It made choosing the right one impossible (the ‘right one’ – one that allows me to buy books in any format, wherever and whenever I want – doesn’t actually exist). E-reader manufacturers simply monopolise our book-buying choices. This annoys me, because I want the convenience and flexibility but I’d rather my local Readings or the Brunswick Street Bookstore took a part of the profits on the purchases I make. Yes: as I passed both these institutions on the bus home I felt a little culpable. An e-reader lurks in the pile of books beside the bed. It was perhaps for this reason it took me a few days to take the gadget out of the box. It was as if I were introducing a new cat to the household. I left the e-reader in the hallway and went into my room to pet and reassure all of my printed books. On day three I opened the box and charged the reader up. A week after buying it I set up my account and finally let it sit on the dresser just inside my room. Later still, I downloaded a few samples (I hadn’t bought anything yet). I cautiously placed the reader on the stack of books by my bed, cooing warmly to the printed-brood. I even thought about taking it back (so strong was my guilt). But again and again I came back to those frustrating moments when I needed a book for my research and couldn’t get a copy anywhere, when a day of productivity was lost traipsing to a library at some distant university to read or copy just a few of the relevant chapters. So I kept the e-reader, picking it up for a time every now and then. Eventually I found myself in need of some guidance on my work. To my surprise none of my usual reference-tomes had chapters of relevance. (They are all still great books if you’re interested: Sol Stein’s Solutions for Writers, William E Blundell’s The Art and Craft of Feature Writing and William Zinsser’s On Writing Well). I did a search on Google, but nothing helpful came up. So I went to my e-reader and soon found a book that was suitable. For the price of three pots of tea in a café I had it ‘delivered’. I was working to resolve the writing issue within minutes. It was just too easy, and all of the anxiety and guilt I felt about buying the thing evaporated. The stranglehold of manufacturers still leaves a sour taste in my mouth. And I know it will make things more difficult for publishers and their writers while we all try to negotiate profitable terms. But I think the monopoly will eventually be toppled while the technology will remain. And though the gadget proved its worth (and has continued to do so) I haven’t stopped buying hard copy books. For me, the experience of shopping for, and reading the real thing is still infinitely richer. Yet these technical developments and new forms of distribution harbour tremendous potential for writers. In next week’s post I’ll discuss just that, including part two of my interview with Mark Davis. Long ago, when I returned from a year of working and backpacking overseas, I lived in a shared house. A few months into my tenancy, my birthday came up and I was chuffed that my five other housemates cooked me a simple meal to celebrate. In the chilly winter air we talked over candlelight and cask wine. That night, every conversation spun around travel. As I’d recently returned from overseas my new friends asked about my adventures, and listened eagerly to my answers. And then, bang on 11 o’clock, they all stopped talking, wished me a happy birthday and left the room. One paused at the door to explain: this had been my birthday present, ‘A chance to talk about your travels,’ she said. It’s funny how travel itself is so often exciting - yet listening to other people’s adventures can send us into comas of boredom. Not so at the recent session, International Research, at the NonfictioNow conference. The four speakers, Mieke Eerkens, Benjamin Law (The Family Law, Gaysia) Stephanie Elizondo Griest (Around the Bloc, Mexican Enough) and Desmond Barry (Cressida’s Bed, Falkland Diaries) had the rapt attention of their audience. They shared a few of their travel tales and some great tips for writers considering international research. You may think that you’re well organised but Eerkens warns us that some things (such as accessing archives) can take much longer than expected. She approached one institution eight weeks before her arrival only to discover that they needed four months’ notice. Once there, signing documents and making other commitments chewed into her research time. Eerkens spoke the language in the country she was researching, but many of us won’t have bi- or multi-lingual abilities. Griest says it’s ‘profoundly important for writers to learn as much as possible of the language.’ Even speaking it poorly can be an asset – it infantilises you and can help to equalise any power imbalances when you’re in a country with less power than yours, she says. Still, some of us will need translators. If you’re on a budget, Law recommends approaching local universities, and using students of translation and linguistics. To help us understand our subjects Griest advises writers to ‘live the lives’ of those we’re researching as much as possible. Rent a room in their neighbourhood. Eat their foods. Hang out at their haunts. And practice humility. ‘Understand and deeply appreciate that what we do [as writers] is the greatest possible privilege,’ she says. Her respect for her subjects is so strong that Griest shows her work to them before publication. 'It’s a partnership.' Plus, no matter how careful you are you will make mistakes. (And yes, she has had to make changes and cuts as a result of this approach). Griest’s first book, Around the Bloc started with this principle. She simply approached strangers and asked them where the orphanage was (in Russian, of course). She did this for days, until she found an orphanage that led her deeper into the story. ‘There was literally no method to my madness,’ she says, ‘I would hit the street everyday, looking around, taking notes and being there for a very, very long time.’ Being there, being open, being flexible and talking to the locals are central to successful international research, ‘But in pursuing our research, we can [inadvertently] ignore our instincts,’ Eerkens says. The story is important, but so is our safety. Travel in itself can be a churn of fun, frustration and fear. Adding research whips up a storm of technical, cultural, emotional and physical challenges. ‘An international research project needs an idea that you’re really in love with,’ says Barry. Once you find a story you love, you’ll be all set to tell others of your adventures. And if you write it well, you may even get an opportunity to regale your readers far beyond my 11 o’clock birthday curfew. An audio file of this panel on International Research will be available on the nonfictionlab.net.au website in early 2013. On my first morning in Paris, I awoke to the sounds of suitcase zippers and rustling plastic bags. A couple of girls whispered to each other as they brushed their hair and sprayed their too-sweet deodorant about. My mouth tasted of yesterday’s airplane. At first I was disoriented. So I lay for a while, wrapped in my sleeping bag and taking stock. Once my fellow backpackers left I eased my feet down the bony metal bunk-bed ladder and onto the not-quite-sticky carpet. At the arched window, I drew the curtain. The room was on a pretty Parisian street. A few people passed on the pavement below. Pot plants filled with geraniums flowered on the balcony next door. I saw a Boulangerie a few doors over. Around me were classic white buildings, each – like mine – three or four stories high. In the one immediately opposite a young man appeared in the full-length window holding a mug in his hand. He was dark, and handsome. He was also completely naked. ‘I’m in Paris!’ I exclaimed to myself. The truth is, there’s only one part of those paragraphs that I remember with any certainty (the naked man, of course). The rest is made up from my fading, unreliable memories and images of Paris I picked up over the years. I could never publish those pars as non-fiction – and even if I tried, I think I’d be called on it. There’s a certain authenticity missing from my descriptions. Had I kept a better journal I may have been able to take you into that room. But (like most of my travel journals since) my notes were about what I did, ideas, events and occasionally frustrations. I’ve always known that I’m a bad travel-journaller but it wasn’t until Natalia Rachel Singer’s presentation at NonfictioNow that I realised where I was going wrong. Singer is the Craig Professor of English at St Lawrence University in the USA, Contributing Editor to The North American Review and writer of a memoir, Scraping by in the Big Eighties. She was presenting a paper in the session, Immersion Writing, and her advice was this: keep a journal of the senses. ‘A good journal… allows you to be alive in the moment, to experience it fully through your five senses, your mind and heart, and then to record it in such a way that you’ll be able to relive it again and again,’ she writes in a brief for her students (whom she takes to India and France). ‘What I’m asking you to record is not so much what you did…as to what your body experienced there: visual impressions, colours, textures, smells, sounds. What it meant to be alive there. How the place got under your skin…’ she tells them. Sensory memories can call us back to a place for decades to come says Singer. For Marcel Proust it was a madeleine. For me, it’s the smell of freshly cut grass which, still reminds me of visiting Australia from my childhood home of Hong Kong (even though I’ve now lived in Australia for over 30 years). I have so often eschewed journal-writing during travel for the promise of truly being in the moment. (I had all but given up on the idea of writing travel stories). But now I am starting to think that a journal of the senses will put structure to my travel notes. It will enable me to write lists rather than prose when I’m so inclined. This is how I research and take notes for my non-travel stories (I allow myself to be in those moments as a writer). Somehow up until now I’ve seen travel differently. Over the years I have learned to document the facts of travel (things like addresses, telephone numbers, prices, times, dates, opening hours etc.). I kept paper artefacts in my journals for purely aesthetic reasons. They included ticket stubs, brochures, business cards, maps, coasters and wrappers. As Singer notes, keeping these things can save time detailing costs and basic facts. A glue-stick will go nicely with your journal of the senses. Singer’s presentation was part of a panel on Immersion Writing that included Peter Doyle, Robin Hemley and Kate Rossmanith. An audio recording will be available on the nonfictionlab.net.au website in early 2013. ‘Cliff hanger’ and ‘conference’ are words that don’t often play in the same scenario. But when Malcolm Neil was cut off mid-presentation at last week’s Independent Publishers Conference these words came to mind. Neil is Director, Content Acquisition and Publisher Relations, APAC at Kobo Inc. Kobo provides e-reading services (including e-readers and e-books) to over 200 countries. When Neil’s presentation abruptly concluded, he was sharing some choice insights into the behaviors of e-book purchasers. This is an advantage that e-books have on the ‘device’ of a hard copy book: detailed metrics. Although providing the ‘detailed’ part would be commercially sensitive, Neil still gave interesting metrics to conference delegates. For example, Kobo has configured their email marketing to book-buying prime times: 10am and 8pm (you’ll notice a change in my social media habits as a consequence). Women are the predominant e-book and e-reader buyers (no surprises there). Women 65+ buy more than 12 e-books per year (that one did surprise me). Neil spoke to us onscreen as if from the future. In fact he presented from his Singapore hotel room via Skype. And then his video-face froze, and a little ‘bzit’ line went across the screen and we all said, ‘Oh dear’. Neil did try to call back, but we lost him again and went on with the other presentations. Speaking to him after the event I mentioned the technology had let us down. In fact it was the electricity at his hotel – not the Internet – that failed us. It’s an important point, given our subject matter. Neil provided a few more choice stats to me. The bad news for non-fiction writers is the e-book market is predominantly a fiction one (more like 80/20 fiction/non-fiction in contrast to 60/40 in the print market). On the upside, there are more opportunities to find readers for self-published work, which as Neil says, ‘Is a little obvious when you think that in a physical book store you’ll find next to no self-published books.’ Still, it’s always good to see the theory reflected in the stats. Around 5% of e-books purchased are self-published. I came from the conference with a sense that publishing had perhaps made amends with the ‘threat’ of e-books. Maybe it’s because I’m semi-converted (I’m distributing my own work and reading others’ electronically). Perhaps there’s room for both print and electronic. Maybe the change in publishing will hit a point of disruption to traditional publishing rather than complete annihilation. ‘That notion [of disruption] is not borne out by the evidence,’ Neil says. ‘Where you might have sold 3,000 copies of the [print] book you might sell 1,000 in the future. And those numbers will continue to change.’ Bookstores everywhere have modified their stock to include products that – unlike books – bring in strong margins. In the Australian context this need is exacerbated by fluctuating exchange rates. ‘I think there’ll still be bookstores and print sales because it’s an object, and people like buying objects. But ultimately as the economy of e-reading becomes more affordable [the print book is] in danger of becoming a secondary part of publishing.’ As well as that, once readers buy into an electronic provider (such as Amazon) they’re within that eco-system. ‘They’re going to get other emails about physical books. So they’re going to start purchasing [those] online as well,’ Neil says. He reminds me to look at job cuts in publishing and, ‘the way large publishers are nervously reconfiguring their businesses.’ (Although, as Mark Davis tells us, technology isn’t the only reason these changes have occurred). Watch a video of Malcolm Neil presenting more choice info at the Copyright Agency's 2012 Annual Seminar 'Digital Publishing Today'. ‘One of the things that’s most annoyed me about the present debate [in publishing is that] it’s boiled down to one between techno-evangelists and technophobes,’ says Mark Davis Associate Professor (University of Melbourne) and non-fiction writer (Gangland: Cultural Elites and the New Generationalism). ‘We get caught up in that divide all the time and it doesn’t get us anywhere.’ While the neon light on top of the tallest building in town heralds e-books and digital media as the big challenges in publishing, Davis reminds us that the sector was in a state of crisis before these came along. ‘In Australia [that] oriented around questions of pricing, questions of distribution, battles for market share and how they play out,’ he says. In his keynote presentation at the Independent Publishers Conference Davis will draw on his research at Melbourne University to consider the various issues that have flowed from the last few years of ‘absolute doom and gloom’ in the publishing industry. ‘Everyone seems to think that it’s all over [in publishing] – it doesn’t matter which side of the digital divide they’re on,’ he says. Davis is interested in that notion, but encourages us to expand our thinking. ‘All the talk has been about the economic side of publishing [but] reading is a social act,’ Davis tells me. What we write in long form is tied to a human need to communicate and debate ideas, be they personal, cultural, historical, political and so on. We can discuss delivery and distribution of writing from an economic or commercial perspective. But we must also consider how changes in delivery and communications help or hinder society. It’s a timely reminder in a week when US citizens are deciding their next president – many on the basis of information and opinions they have gleaned from a wider socio-political debate (to which writing, and long form have contributed). Of all the questions that circulate around publishing, and the future of publishing, the one that engages Davis is how to create (or maintain) a sense of polity and democratic purpose for society in a new media galaxy. ‘One of the things that interests me about the post-digital transformation is the de-professionalisation of writing,’ says Davis. It puts power in the hands of many and provides forms of access. But it’s a double-edged sword, ‘At the same time it completely fragments audiences and the notion of a polity,’ he says. ‘All of our traditional models of intellectual culture are around print,’ says Davis. Given this we need to ask ourselves how intellectual cultures operate in a digital world. ‘Do we need intellectuals? Do we want intellectuals? Are they just elites that we could do without anyway? Or did they have something to offer? If so, what did they have to offer and how was it presented?’ Davis asks. Oftentimes, he says, it is presented via long form non-fiction. Technical, commercial and economic disruptions in the publishing industry need to be considered. But a greater concern for long form writers and readers may be finding a ‘social common purpose’ in a fragmented world. ‘[That’s] what long form’s always been about… exposing ideas, exposing wrongs and saying, “This is something that should be on our social agenda and it isn’t,”’ Davis says. Mark Davis will be presenting a keynote speech, ‘Publishing in End Times’ at the Independent Publishers Conference 3.30pm, Thursday 8 November at the Wheeler Centre in Melbourne. I like to think I have a broad outlook on the potential of writing and new media. But in speaking with John Weldon, writer, author (Spincycle), academic (Victoria University) and coordinator (Meanland), I realise there is something my research has failed to uncover. I am embarrassed by the oversight. But I’m taken by it too because it shows me that I am conceptually blinkered, that my view of writing and new media is thwarted by the way I consume the printed word. Weldon’s approach has expanded my view, and makes me wonder what else I am missing. ‘The effect of digitisation on narrative and story [is] the idea that it’s no longer confined or contained within the pages of a book,’ he tells me. He’s talking about a comment he attributes to author William Gibson, ‘The text doesn’t stop at the end of the page.’ The comment is the title of a paper Weldon will present at next week’s Independent Publishers Conference. But the phrase is more than that. It has informed Weldon’s approach to storytelling and new media. ‘We can see that books have very much moved beyond the printed page. But most of the digital books are simply… a photocopy of the page,’ says Weldon. He’s keen to see authors and publishers move beyond this linear approach to both reading and writing. If you’re as blinkered as me by a ‘delineation’ of print and digital you might presume that Weldon is talking about hypermedia. But he’s not. ‘We have to be careful we don’t take it too far beyond the page. Enhanced e-books are often too alienating for the reader. They’re not sure how to interrogate [them]: where to start, whether to watch the picture, listen to the sound or read the text… The actual physical form of the book is integral to the way we read – that’s how we’re used to doing it,’ Weldon says. It was while working on his recently published novel, Spincycle, that Weldon realised the potential of new media and fiction. He was grappling with problems of perspective and character, ‘but if felt clumsy and forced,’ he says. He came up with the idea of a character writing a blog, ‘which exists in the book and exists in the real, virtual world… [It was] a way for me to do [the] internal monolog, and … a way for readers to actively and actually engage in the conversation that goes on in the book,’ he says. He describes character-voiced blogs as ‘a gentle step’ toward taking fiction beyond the page. For Weldon, this conversation between author and reader harks back to oral storytelling. ‘When all stories lived without the page, there wasn’t a page. In all the storytelling cultures those lines weren’t as harshly drawn,’ he says. When people tell stories orally the storyteller responds differently to each audience. The audience can comment, heckle and through this, change the form and direction of a narrative. ‘[New media] offers us a chance to play with those things again – where the reader can become author, and the character can become author, and the author can become character and reader,’ he says. In his paper next week Weldon will be appealing to small publishers to rethink their approaches to print and new media. ‘Marshall McLuhan said [that] when we have these new technologies it’s always the artists that show us how to use [them]. I think small publishers who are more willing to experiment in conjunction with authors might show us how to take the text beyond the page,’ Weldon says. I wonder if wider society is becoming more accepting of consuming text beyond the page. Have we failed to understand how storytelling might evolve digitally because we haven’t fully understood the technology and its potential? Weldon reminds me that as early as Ancient Greece we have questioned new technologies be they writing, printing, photography, film, television and so on. John Weldon will be presenting his paper, ‘The Text Doesn’t Stop at the End of the Page’ at the Authorship and Digital Publishing session of the Independent Publishers Conference 9am, Thursday 8 November at the Wheeler Centre in Melbourne. Are you reading as much as you’re writing? And if you are, what are you reading? Are you reading – and buying – the kinds of publications you want to be published in as a writer)? ‘So many people want to write, and less want to read,’ says Amy Espeseth, writer (Sufficient Grace, Trouble Telling the Weather), publisher (Vignette Press) and academic (NMIT). ‘If everyone who submitted to Geek Mook had bought a [copy] we would be able make a lot more future publications… our goal is to break even and we’re certainly not breaking even,’ says Espeseth. It’s a reality for small publishers echoed by Zoe Dattner, General Manager of the Small Press Network (SPUNC) , ‘So much goes into [publishing a work], and when it disappears without a trace [it’s disappointing].’ Dattner says this happens ‘all the time’. I’ve heard the calls to writers to buy the publications we want to write for – as has Espeseth, ‘Oftentimes as writers we get kind of frustrated at the lack of money [and] the lack of support. I’m very much in support of all of the conversations,’ she says. But Espeseth has the publisher’s perspective too, ‘at the same time I’d like to acknowledge that (for me as a publisher) the money is coming directly out of my pocket. I’m gambling on you. I’m betting on you. And more often than not those gambles or those investments don’t work out financially,’ she says. The money debate aside, the relationship between writer and publisher has always been one of co-dependence. Writers don’t work in a vacuum. We need good writing and stories to read. We need new ideas to consider. We need guidance on our phrasing, structure and grammar (plus proofreading!). And of course, we need ways to get our work to readers. While new media does give writers more options for distribution, going through a reputable publisher would be the choice of most. Validation from a publisher is a kind of vindication (not to mention flattering to the ego). And publishers are more able to get our work to readers. As well as that, publishers (and their editors) can vastly improve the quality of our work. ‘It’s a not very well kept secret for people who work in the industry that your editor or your publisher will sometimes change the trajectory of a work,’ says Espeseth. The Raymond Carver / Gordon Lish ‘partnership’ is an example at the extreme end of the spectrum, one which resulted in the later publishing of Carver’s stories uncut. But writers like Espeseth daily express their gratitude, ‘Without [Aviva Tuffield and Ian See’s] help and assistance I don’t think I would have ever finished [Sufficient Grace]. And it certainly wouldn’t be the book that it is without them,’ she says. The secret may not be well kept, but it is, as Henry Rosenbloom of Scribe recently wrote, a ‘dirty’ one. ‘Everybody has internalised the editor’s role, without ever acknowledging the contingencies it has to deal with. Nobody outside the publishing house knows the challenges that were presented by a given manuscript, and nobody knows how much or what it did to help improve it,’ he writes on the Scribe website. The writer’s name is most often noted outside the publishing industry. But without the publisher there wouldn’t be a book, or at the very least, there wouldn’t be the same book. ‘Although the writer does a lot of work, the publisher does as well. And it shows a lot of foresight and commitment when people choose to put their time, energy and money into publishing someone else’s work,’ says Espeseth. That’s why the literary prize that she’s recently judged (with Bethanie Blanchard and Andrew Wrathall) awards both writer and publisher. As its name implies, nominees for the Most Underrated Book Award (MUBA) can’t have won any major awards as a published book. It’s the kind of prize you would never aim to win, but having won it, would certainly celebrate (with your publisher). The shortlist comprises four fiction titles (The Dark Wet by Jess Huon (Giramondo), I Hate Martin Amis et al. by Peter Barry (Transit Lounge), Two Steps Forward by Irma Gold (Affirm Press) and The Cook by Wayne Macauley (Text)). The winner will be announced on 8 November and all four titles will be discounted 20% at Readings for a month. Although this year’s final list comprises fiction, Espeseth says that nonfiction titles were nominated. It’s anticipated that next year’s awards will involve different genre categories. The deal at Readings will do its part to support the writers and publishers of the MUBA shortlist. Meanwhile I hope that writers will reconsider their budgets for beer and books. Small and indie publishers unite! I’ve been trying to imagine a world without small and independent publishers. I can’t do it. I’ve tried to draw parallels. For example, I’ve wondered if it’s like a world without electricity, or a world without roses to smell. But neither is an appropriate comparison. When I try to imagine a world without these publishers my mind goes blank, short-circuited by the complexity and depressing force of the idea. Initially this was a great frustration. Then I realised my blank brain was illustrating the point: a world without small and independent publishers is a world with far fewer voices and ideas. It’s a whiteout. ‘I see independent business [including publishers] as a very strong force for good and for positive change in the world in general,’ says Zoe Dattner, General Manager of the Small Press Network (SPUNC). She also sees these publishers as more able ‘to beat their own drum’ thus contributing to the diversity of voices available for readers (and venues available for writers). And if participation in SPUNC is anything to go by, this diversity is diversifying. In the last two years membership has grown from 50 to 100. This year SPUNC will hold the inaugural Independent Publishers Conference in Melbourne on 8 and 9 November. The presence of so many small and independent outfits means that writers wanting to publish are more likely to find a welcoming venue. That sounds like cause for champagne and chocolates! But when it comes to those hardy souls behind these publications – often small or singular teams, running their publishing efforts alongside a day job – love and squalor may be a more apt pairing (that is, a lot of love and just a little bit of squalor). ‘It’s a very difficult industry to make a crust in,’ says Dattner, (noting this is her ‘own personal belief’). ‘I don’t think that it should be so difficult. Publishers (particularly small publishers) come to it out of passion. They’re not necessarily interested in making money but they’ve found a manuscript [and] they really want to publish it. They get so passionate about doing that one thing, and then they stumble at all the different obstacles that exist between them and selling a book to a reader,’ she says. More recently these obstacles include changes to technology and distribution models. Another challenge, ‘is for small publishers to approach the climate that we’re in with a business head on. Which is hard because [we] are often creative types,’ Dattner adds. (And creative types she says, don’t always think with business heads). All in all, small and independent publishers, ‘could be sharing a lot more knowledge, and asking a lot more questions, and admitting to a lot more,’ says Dattner. To facilitate this, sessions at the conference include production and workflow, digital strategies, marketing and trends (as well as opportunities to network). There’s also an academic day. (See the full program for both days on the SPUNC website). Plus, the conference will host ‘The Most Underrated Book Award’ (MUBA) which will privilege both writer and publisher. The MUBA – like the conference – celebrates the staggering contribution small and independent publishers make to our literary culture. ‘The opportunities are huge – far bigger than the challenges,’ says Dattner. She explains that small and independent publishers have a lot less to lose than their mainstream counterparts. They are therefore nimble, able to act quickly, are good at identifying opportunities and approaching them without fear. For Dattner, the biggest win is that small and independent publishers are, ‘in a position [to] reinvent however we want to do this. But it requires either an approach that has been done before but is a lot better, or a brand new one that no one’s ever thought of.’ The key to harnessing these opportunities is that, ‘you’ve got to be open to them,’ she says. As a participant in the literary community I tend to focus on the challenges facing writers. But I know my pages would be blank – indeed, a whitewash – were it not for the efforts of small and independent publishers. I hope the conference and the MUBA do their part in encouraging, growing and celebrating this integral part of the literary community. 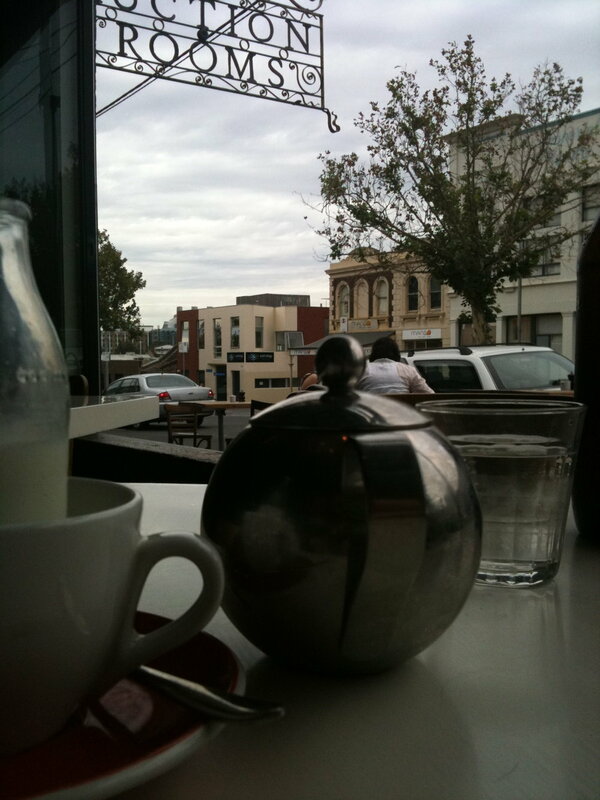 I was in a state of absent-mindedness, sipping tea at a café on the edge of a writerly event. There was a din that echoed around the high-ceilinged space. People passed through the beam of my vision, noticed yet somehow unnoticed. My stare occasionally attached to bright things: a balloon on a string, a pair of red shoes, a fluorescent light high on the ceiling. At one point my gaze drifted upon a row of trestle tables where writers who had just presented were signing copies of their books. I sipped my tea again, inspecting the lines of inspired readers. And then the question came to me: Why is it that we like signed books? I wrote up the story ‘The hand that signed the title page’ which was later published in Meanjin. The idea was a collaboration of sorts: one between me and the outside world. If I wasn’t near those tables I wouldn’t have had the idea. It depended on me being out, and open to seeing new things (albeit absentmindedly). I love this about writing non-fiction. I love the things you weren’t expecting, the stories people share with you and the ideas that give you new perspectives. And it all comes from participating in the world beyond our desks. This year, the NonfictioNow conference is leaving its desk in Iowa, USA and coming to Melbourne (from 21 to 24 November). It’s the first time the conference is travelling, a move inspired by an Australian delegation that joined NonfictioNow in 2010. Co-chair and founder of the bi-annual conference, Robin Hemley (also Director of the Nonfiction Writing Program at the University of Iowa) says that the success of that international interaction (partly fueled by the cities’ connection as UNESCO Cities of Literature) inspired him to choose Melbourne as this year’s base. Connections, collaborations and bringing people together was at the heart of Hemley’s move to start the inaugural conference in 2005. It was influenced by a similar innovation of his father, writer Cecil Hemley, who with Adolph Gottlieb and Weldon Kees started a series of meetings for artists in 1949. ‘Forum 49’ has since been recognised as landmark gatherings for the Abstract Expressionist movement. From this experience Hemley saw the benefits of bringing people together. ‘I’m proud of the fact that a number of really fine projects have come out of these conversations,’ he tells me. So far the conference has spawned several (including a film inspired by a chance reconnection). Hemley says the conference is geared toward practitioners, ‘I always try to avoid the boring academic conference where people are just reading stodgy papers to each other. It’s awful and that’s not a conversation,’ he says. But it’s not a purely craft-based conference either. Topics discussed will include themes common to non-fiction (such as the fact verses fiction debate). Hemley says these discussions will, ‘move the conversation forward and not just get stuck on the same subject all the time.’ He hopes delegates will go away with a stronger understanding of the boundary-pushing work that is being done in non-fiction. ‘What you can expect is a conference unlike any other because it’s not a conference where authors come to flog their books. It’s really a conversation between writers and teachers of non-fiction… We’ll be talking about where non-fiction’s been, where it’s going, new directions [and] some of the hot topic issues,’ says Hemley. If Hemley's inspiration for the conference has its way with you, you may come away with a few story ideas. At the very least you'll meet some kindred spirits from across the globe. The full program will be released soon. You can find it and registration details on the NonfictioNow website. Future of Long Form is one of four official blogs for NonfictioNOW. I will certainly be there to collaborate, contribute, sip tea from the edges, stare absentmindedly and see where it all takes us. From the early morning of August 24th I am in possession of a treasure. In the days that follow I find myself coming to a stop along Swanston Street and rummaging through my bag until I feel the shoelace-like necklace in my hand. When I wear it around my neck in Federation Square I anxiously grasp at the pendant (flat, and the size of a credit card) seeking certainty that it is there. Technically it’s now void, worthless even. But I think I will treasure it for a little while yet. It gave me access to the thoughts and minds of dozens of writers and provided enough inspiration (and topics for futureoflongform.com) to keep me going for months. One of my favourite lines from this year’s Melbourne Writers Festival is from 'The New Yorker' team (paraphrased) A ‘New Yorker’ piece has beats in it. It moves you through ideas. It isn’t a waste of time. That one’s going up on my wall. At his ‘In Conversation’ session, Robin Hemley quotes Tobias Wolff as saying (paraphrased) Some stories have to be told, they create a kind of volcanic pressure within you. Lee Gutkind speaks of his research work for ‘Almost Human: Making Robots Think’. He tells writers pursuing similar immersion projects to, ‘find a long term project with a beginning and an end.’ As far as cracking into those projects he reminds us that, ‘lots of people think what they’re doing is really important and thinks nobody notices.’ Thus if you show those potential subjects that you understand and respect what they’re doing you are likely to be allowed in. But he warns, ‘if you don’t immerse yourself for long periods of time – if you don’t watch them succeed or fail – then you’re not a part of it.’ (For more on this session check out this post by Samantha van Zweden). I am asked by my fellow Emerging Bloggers what the highlights of the festival were for me. I think first in sessions, ‘I learned a lot from David Grann’s presentation,’ I say. (And wrote that up too). Interviewing Robin Hemley and Hattie Fletcher were highlights. It meant something to me to shake Lee Gutkind’s hand and thank him for his indirect advice and inspiration over the years. But I also learned from those around me. Bloggers emerging and official blew my socks off with their speedy-yet-beautifully-written post-session reviews. (especially Alice Robinson, Angela Meyer, Andrew Bifield and Samantha van Zweden). Jen Hansen – a savvy journalist in her own right - reminded me of the importance of chutzpah. As a session chair Estelle Tang showed that earnestness, intelligence and humour are not mutually exclusive. The entire cast of The Radio Hour should stop us all from referring to ‘This American Life’ as the cultural touch point for good radio documentaries. It was proof enough of the trove of local talent we have. And then there’s the people who made the festival happen – outgoing Director Steve Grimwade and his amazingly talented team (including my main contact, Imogen Kandel). And those who made it happen for me, Karen Andrews and Lisa Dempster at the Emerging Writers Festival. Generous legends, all of them. It may be void of value, but I am sure this pass has some kind of a half-life. For this reason it will remain a treasure for me and take pride of place at my desk alongside the framed ‘Remittance Advice’ of the first article I was paid for. A few months ago I wrote a story for a glossy magazine. I couldn’t find my potential interviewees online or on the phone. I had to get out amongst them, and query each one until I had the stories I was looking for. I gleefully went out and popped my digital recorder in front of the mouth of anyone who would speak. I took a minute or two of their time, jotted down their telephone number and went on to the next. Of every twenty people I spoke to, I found one or two that I might interview. As I wrote the story, that number went down. Writing is so much about cutting. Paring it down makes it a better piece. But I always feel a little twinge of guilt as I cut characters and stories from my work. These aren’t imaginary characters I’m cutting. They’re real people. Tjhia’s preparation for this topic began earlier this year – as did my involvement with the project. Back in April I saw a call-out from Paper Radio. They were looking for ‘interesting or funny stories about translation or a gap in language.’ I’m not one to get in front of the microphone or the camera, but after a year in Japan (which included the 2011 earthquake, tsunami and nuclear meltdown) I thought I might have some stories to tell. And I saw the call-out as an opportunity for something else: it was a chance to put myself in the shoes of those I interviewed. I was surprised how quickly I became a nervous interviewee. On the bus heading into town to meet Tjhia my heartbeat quickened. Once there I worried that my mouth would sound pasty and that I’d spit on the expensive-looking equipment before me. Worse still I feared I’d say something stupid. I could hear the tension in my own voice. And I like to think of myself as someone who doesn’t get nervous about these things. After all I know how it works. Imagine what it’s like for those we interview? When Tjhia interviewed me, his focus was on language and translation, but like all stories the idea evolved. ‘We had this emergent theme of sign language – which wasn’t really what we had thought of initially but it kept coming up. And it came up not just speaking to people about deafness, but also people being in different cultures and that being a way to bridge (to some extent) [the language] divide,’ Tjhia says. Tjhia and his co Executive Producer, Jessie Borrelle, did about eight hours of interviews. ‘It’s really important to gain the trust of the person,’ he tells me. ‘You don’t really get to what’s important in a story in talking to someone for ten minutes,’ Tjhia transcribed all of the interviews. ‘Even on the [final] topic … we had some other interviews that - whilst they didn’t make it to the final cut for this thing - we’ll hopefully use later on,’ he says – noting that every single interview, ‘informed much more richly the background of our research.’ (I’m pretty sure I’ve been cut – but I don’t ask, because a) I want to mimic the experience of those I interview as closely as reasonably possible and b) I don't mind if I'm cut). Some of the other contributors will use live music. Tjhia has prepared samples for his final piece, and will be mixing it all on stage. ‘It will be sort of like live radio… fading up and down, going to tracks,’ he says. But it will be ‘highly premeditated, tightly timed… I’ll try not to lose my way in the script in the process,’ he quips. Tjhia is keen for those who attend the session to come away with, ‘an excitement about the way audio stories can be told and… [the] freedom of that space.’ He wants the audience to have a better recognition of the strength and creativity already present in Australian radio. ‘This American Life has been tossed around a whole lot in describing this event… I don’t think that we should have to rely on the old powers for our cultural touch points,’ he says. Sunday’s event will be the conclusion of my experiment as the interviewee. I expect it will inform (if only in a small way) my approach to contacting those whose voices won’t appear in my articles. But I have a feeling that there will be a pleasure (indeed, pride) of having informed and helped to shape somebody else’s creative endeavour. And I’m certain that ‘The Radio Hour’ will do its part to celebrate the great audio storytelling talent we have in Australia. ‘The Radio Hour’ is on Sunday 2 September at 6.00pm at the Arts Centre. The final hour will later be broadcast on Radio National’s 360Documentaries.